As one of the tallest flowering bulbs in the gardening world, gladiolus can be a challenge to keep from falling over. The stems naturally grow toward the sun and, once bloomed, the weight of the flowers might make the stems tip to the side or even break. You can take several steps to reduce or eliminate the threat of broken or fallen stems, including staking, planting in tight rows, and planting against a fence or other stationary object. The beautiful, but tall, gladiolus benefits from staking and strategic planting. Plan your garden planting scheme before putting your gladiolus bulbs in the ground. Sketch your garden on paper, being sure to include non-living items in the garden such as fences, walls, boulders and garden art. Determine which walls and fences get adequate sun for your gladiolus' needs. You may need to watch the sun's pattern in your garden on a typical summer day to figure this out. 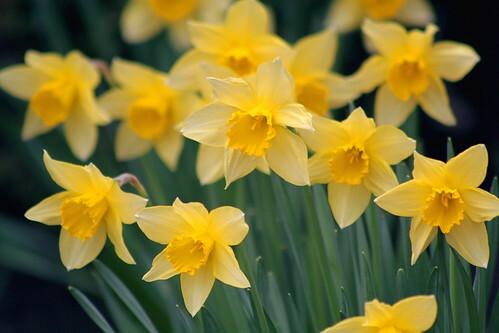 Plant your bulbs, lining them up against the wall or fence in your garden. As they grow, they will use that wall as support. Since they are tall, gladiolus benefit from being toward the back of the garden where they can't tower over other plants in addition to using the wall as support. Mark off the area in your garden you would like to plant your gladiolus. This can be a row or block area, depending on your preference. Measure the spots to plant your bulbs in the section you have reserved for your gladiolus. Normally, gladiolus bulbs should be planted at least 4 inches apart. In this case, you will plant them 2 to 3 inches apart. Plant your bulbs. Because they are planted more tightly than usual, the stems will support one another as they grow. 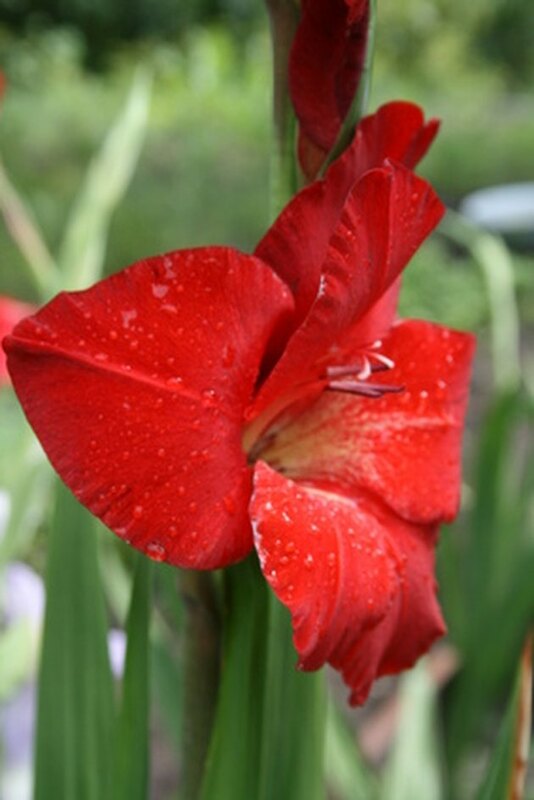 Water and fertilize your gladiolus regularly according to your bulb's directions. Flowers that are planted more tightly together than usual are competing for nutrients in a smaller amount of space and benefit from the extra nutrients fertilizer provides. Plant your gladiolus bulbs in any location in your garden, keeping in mind the flower's sun requirements. Stake the stems as they reach approximately 2 feet tall. Press a tall stake into the ground approximately 1 inch next to the gladiolus, taking care to not spear the bulb. Sink the stake 8 to 12 inches into the ground. Attach the stake to the stem with a length of twine 4 inches from the ground. Tie another length of twine around the stake and the stem 18 inches from the ground. When to Plant Gladiolus Bulbs?